Create a new data file for the first tax year using TradeLog. Please see the lesson: Creating New Data Files under Step 1 in our Online Tutorial for a video discussion of how to use this function in TradeLog. MTM Users – Please review Begin the Tax Year for MTM Users for additional instructions. Each tax year should have a separate TradeLog data file. This allows you to keep each tax year separate for reporting purposes, and reduces the overall size of data files. TradeLog allows you to maintain multiple brokerage accounts within one TradeLog tax year data file. 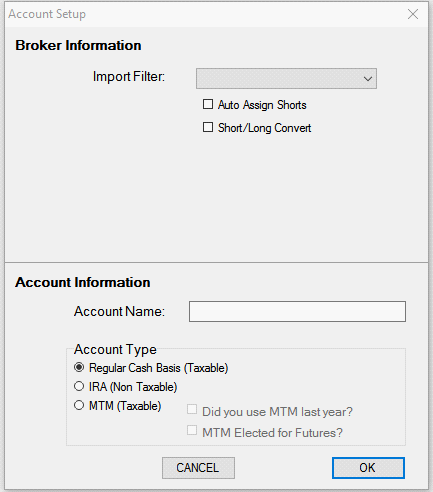 For example: if you have a trading account at Broker A and another account at Broker B, as well as an IRA at Broker B - all three of these accounts can be maintained in one TradeLog file. A separate TradeLog data file must be created for separate entities, such as corporate entities, and should include all brokerage accounts controlled by that entity. B. Select the Tax Year you are working on. You may also type the year in the box. C. Select the Taxpayer ID. D. Enter the Taxpayer Name - THIS MUST BE THE NAME YOU WANT TO APPEAR ON YOUR TAX FORMS. If filing jointly you only need to use the primary taxpayer name. Examples: "John W Cooper", "Joe H Smith. ", "Superstar Trading LLC", etc. Note: Do NOT put a year or date in the File Name. TradeLog will automatically include the tax year you selected in the file name. Remember, the tax year may be different than the current year. It is important that you select the tax year for the data that is going into the file. E. Enter the SSN or EIN (optional) if you selected “Personal” or “Corporate” as Taxpayer ID. This field is hidden by default, select the Show SSN/EIN box to confirm your entry. Note: You can leave this field blank and enter it later. Click here for more information. We recommend PASSWORD PROTECTION on your file if you have entered a SSN/EIN. F. Enter a File Password. Note: This is optional. If you forget your password, please click here to email our technical support team for assistance. G. Select the File Folder. Note: If you wish to save your files to another location on your hard drive besides the default location, please click here for further instructions. We highly recommend leaving the default location (C:\Users\...\Documents\TradeLog). I. Click Yes to Confirm the Taxpayer Name as it will appear on your tax return. Click No, if you need to correct it. The Account Setup dialog box will appear. This will allow you to enter specific account information for one or more brokerages accounts that will be maintained in the file. 1. Select the Import Filter or brokerage firm associated with this account. 2. Select your Default Import Method (if applicable). Click the drop down button and the available options for importing will be displayed. If BrokerConnect is available, this is the preferred method of importing. Note: The options for Auto Assign Shorts and Short/Long Convert will be selected by default if those conversions are required for the broker import you selected. Do not change these unless you have a specific reason to do so or are instructed by TradeLog technical support. 3. In the Account Name field enter a descriptive identifier for the account. For example, if your broker is TDAmeritrade you may put "TDAmeritrade". Note: If you have more than one account at the same brokerage firm, then you will need to give each account a unique identifier. Examples may be: "TDAmeritrade IRA", "TDAmeritrade Trading", " TDAmeritrade John", or you may use your account number. DO NOT put the tax year in the Account Name field. 4. Next identify the Account Type by selecting one of the listed options. - Regular Cash Basis (Taxable): this is the type used for most accounts in which you will be filing a Schedule D for tax reporting. - IRA (Non Taxable): this type is used for any investment/retirement accounts that are non taxable. These accounts will not be reported to the IRS. However, TradeLog will adjust for wash sales that occur in an IRA as required by IRS rules. - MTM (Taxable): this type identifies files that will be filed using the mark-to-market accounting method. This type is only available for users with a version of TradeLog that supports MTM. Click here for specific details on setting up an MTM account. NOTICE: In order to file MTM you must qualify based on federal requirements and complete IRS procedures for election of this method of filing. See our Online Tax Topics for more information. 5. Click OK to complete the account setup. TradeLog will now create the file. It will have the Account Tab created with the name you gave the account. 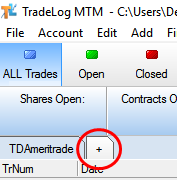 If you have more than one brokerage account, you can setup the additional accounts by clicking on the + tab. Then select Add. You can then repeat steps 1 through 5 above for each additional account. Note: You can add additional accounts to your file at a later time if you prefer.